Reading and share top 10 famous quotes and sayings about Wroth by famous authors and people. Browse top 10 famous quotes and sayings about Wroth by most favorite authors. 1. 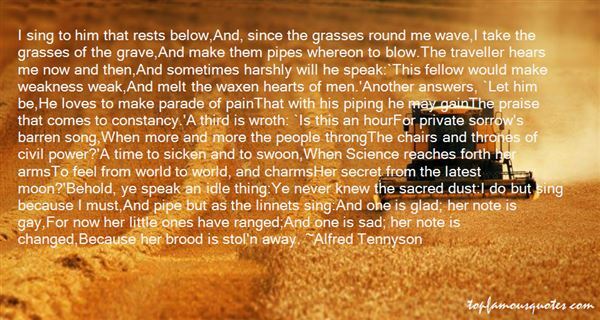 "I sing to him that rests below,And, since the grasses round me wave,I take the grasses of the grave,And make them pipes whereon to blow.The traveller hears me now and then,And sometimes harshly will he speak:`This fellow would make weakness weak,And melt the waxen hearts of men. 'Another answers, `Let him be,He loves to make parade of painThat with his piping he may gainThe praise that comes to constancy. 'A third is wroth: `Is this an hourFor private sorrow's barren song,When more and more the people throngThe chairs and thrones of civil power? 'A time to sicken and to swoon,When Science reaches forth her armsTo feel from world to world, and charmsHer secret from the latest moon? 'Behold, ye speak an idle thing:Ye never knew the sacred dust:I do but sing because I must,And pipe but as the linnets sing:And one is glad; her note is gay,For now her little ones have ranged;And one is sad; her note is changed,Because her brood is stol'n away." 2. 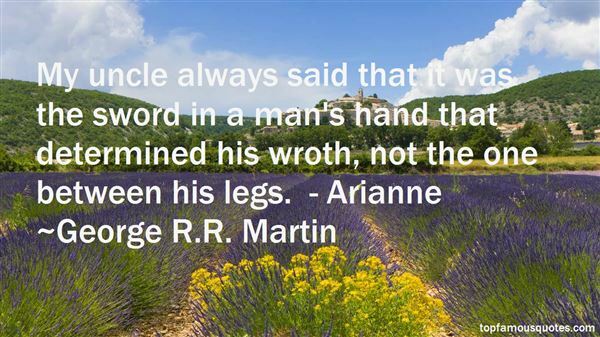 "My uncle always said that it was the sword in a man's hand that determined his wroth, not the one between his legs. - Arianne"
3. "Egg has the truth of it. Aerion's quite the monster. He thinks he's a dragon in human form, you know. That's why he was so wroth at that puppet show. A pity he wasn't born a Fossoway, then he'd think himself an apple and we'd all be a deal safer, but there you are." 4. "When she scooped up her clothes, opened his door, then snapped her fingers for a guard down the hall, Wroth watched like a bystander. "Pssst. Minion. I need these laundered. Very little starch. Don't just stand there gawking or you'll anger my good frenemy General Wroth. We're like this. "He couldn't see her but knew she was twining two fingers together." 5. "Cade hiked his shoulders, pretending nonchalance. "Tell me about the vampire, or not, dove. But none of us really wants to be here. ""I'll tell you," Nïx said, her gaze rapt on his horns. "But only if you let me lick your rock-hard horns—""Nïx!" Regin's attention snapped back to this conversation.Eyes wide, Nïx cried, "Who said that?? I didn't say that! Oh, very well—the vampire's named Conrad Wroth. Best be careful with that one. He single-handedly took down Bothrops the Lich. ""That was Wroth?" He'd heard of the assassin before. Cade grudgingly admitted that the leech did nice work, dealing deaths with a unique, gruesome signature to them. Which was important in their line of business. "Where is he? ""To find him, you need to trail the one who seeks him in sleep.""Soothsayerese? I don't speak it," he said, but she didn't elaborate. "That's all you're going to divvy? ""Wanna know more?" Nïx raised her brows. 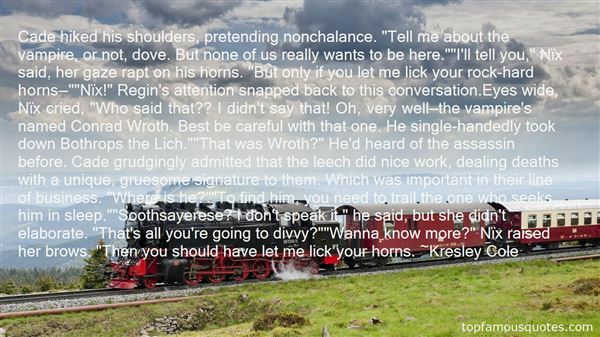 "Then you should have let me lick your horns." 6. "Wroth, darling," she purred, smiling so sweetly. "I can't wait for the next time I get to put my mouth on you." In an instant the smile faded and she snapped her teeth and yanked her head back as if she was chewing something free." 7. "Psst. Minion. I need these laundered. Very little starch. Don't just stand there gawking or you'll anger my good frenemy General Wroth. We're like this"
8. "Myst hasn't returned yet, But you know that, or else you'd both be naked and fornicating on the front lawn" "The night's young. Give us time, and it was a field a mile away. "A Valkyrie and Nikolai Wroth pg 322"
9. "Inside the half-basement, they found Wroth alongside Garreth, grappling to hold up the ceiling. The vampire's voice was incongruously calm when he asked, 'What kind of idiot would find this a worthy plan?" 10. "And to be wroth with one we love…Doth work like madness in the brain." Mismatches destroy us all, even the most tender ones, and most never have the courage to break someone else's heart to follow their own."